Will A Return to School Prayer Help Make Better Schools? Recently, I’ve received several Facebook posts asking for a return to prayer in schools. I would like to believe that the people who post these kinds of things are well-meaning, and that they have not really thought this through. I do not think prayer should be back in public schools because they are public. That means that they are open to any and all, no matter the creed. I have been an educator for 39 years. I have worked in both public and parochial schools, so please do not think I am anti-religion. I am not. There are no laws against prayer in schools. By law, students can bring their own copies of scriptures, they can wear religious garb, they can form religious clubs, and they can pray whenever they like as long as it is voluntary. Prayer led by students, for example around the flag pole before school starts, is fine. In fact, that kind of prayer is protected by the much maligned No Child Left Behind version of the Elementary and Secondary Education Act. What is forbidden is having school officials leading prayer, or anything that makes it seem that the public school is teaching or promoting one particular religion. There are schools where teacher-led, or administrator-led prayer is fine, where it is the norm to teach a particular religion, and any parent can choose to send their children there. These are parochial schools or other kinds of private schools. These schools are not usually supported by public taxes, and , yes, to send a child there one must pay tuition. Some may find the tuition to be prohibitive, yet I’ve worked in parochial schools where every single student was there on scholarship, so tuition is not always a barrier to that choice. The point is that there are schools where a particular religion is taught, practiced, and celebrated. Any family can choose to have that kind of school for their children. There are face-to-face parochial schools and there are online parochial schools, so even those who live in small towns can send their children to a school that has a religious base. Often those who call for a return to prayer in schools are engaging in a kind of nostalgia, a belief that things were better in the good old days. But were they? I can remember when some of the public schools I attended had teachers or administrators who led prayer, and there were Christmas programs that told the story of the Nativity. Let’s go back to one of those years I can remember. Fifty years ago was 1969. That is the year when good things like the Apollo 11 moon landing and Woodstock happened. Teachers and administrators in many public schools led prayers. It was common to have high school graduation have religious overtones. School Christmas programs told the story of the Nativity, and children dressed up as angels and vied to be chosen as Mary or Joseph. It was also a year of much turmoil. We were still feeling the effects of the assassinations of Martin Luther King Jr and Robert Kennedy. Segregation was the norm. It was the year of Chappaquiddick . In many states, women could not have a credit card in their own name and a pregnant teacher was forced to quit when she began to show. Richard Nixon took the oath of office, and a few days later, perhaps coincidentally, the President’s salary doubled. We were still enmeshed in Viet Nam and the draft lottery commenced. The Stonewall riots took place in New York. The Manson family murdered Susan Tate. In most public schools, girls were required to wear dresses and boys were required to wear dress pants. Tennis shoes were only for gym class. So not everything was as rosy and peachy as nostalgic memories can paint them to be. We have come a long way in 50 years. We can probably all agree that we have a long way to go before we can declare the US a utopia. Would requiring prayer in our public schools change that? Public schools are different than private schools. They are funded through public monies, and they are designed to be more inclusive than private schools, more diverse. When I was an administrator of a parochial school, I could say, “I’m sorry, we cannot serve your child best in this school” and send kids and families away if they did not want to conform to our religious beliefs or rules. On the other hand, in public schools children from all families are welcomed. That means that any given public school could serve students and families who are all denominations of Christian, Jewish, Muslim, Buddhist, followers of Shintoism, Hindu, so on and so forth. 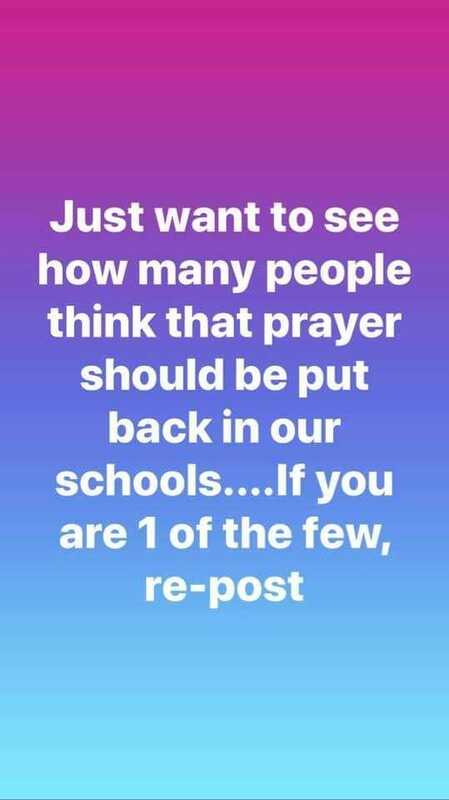 I mention “all denominations of Christians” because I find that the majority of people who post this particular call for prayer in the schools describe themselves as Christians. Yet there are many, many different kinds of Christians. Each of those denominations were formed because a group did not agree with a particular version of Christianity. Within those denominations there are disagreements about which way to say the Lord’s prayer, how to be baptized, and even which day is the day God intended for community worship. If one believes this country is or should be declared Christian, which of the above versions of Christianity do you think should be the basis of prayer in schools? Do you think you and all of the members of your community would agree? Even our Founding Fathers did not share a common religion or even a common version of Christianity. We are a country that has prospered on diversity and by protecting that diversity. Those who disagee often argue that the country was founded by the Pilgrims. That is not completely accurate. There were other colonies in North America before the Pilgrims set foot on Plymouth Rock. There were French and Spanish Catholics. There were other English colonies who practiced Christianity based on the Church of England. Remember, the Pilgrims wound up on this continent after they had sought religious freedom in Britain and the Netherlands. Others seeking religious freedom followed, including William Penn who was a Quaker. The colony he founded was based on religious freedom. And let’s not forget that the people indigenous to the continent had their own beliefs. If we believe in our democracy and in our Constitution, then we believe that no one should be forced to attend a school that promotes a religion in which we do not believe, and we believe that we must uphold the rights our Founders held most dear including the Constitution’s First Amendment. 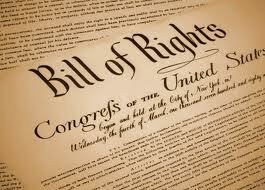 Please note, it is the FIRST amendment, so it was the one that the Founders believed came first. It is my experience that many who call for a return to prayer in public schools believe themselves to be fervent supporters of the foundational beliefs of our nation. The First Amendment, along with the rest of the Bill of Rights, was submitted to the states for ratification on September 25, 1789, and adopted on December 15, 1791. It is the bedrock, the foundation of our democracy, our republic. If one defines oneself as a patriot, then one must defend that First Amendment. So let’s celebrate the fact that we can teach our children about our own, dearly held religious beliefs at home or in a private school with others who have the same beliefs, and that our public schools allow our children to experience the richness of the diversity our country allows and enjoys, a diversity that is not so celebrated in other countries or in other times.